Today - Saturday 14th December 2013 - I need to be certified insane along with 473 other runners! 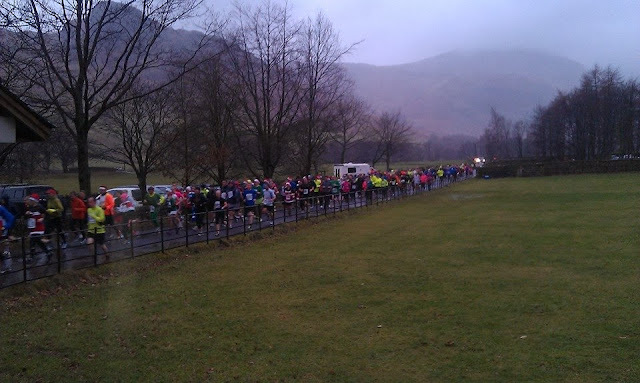 I ran the Langdale 10K Christmas Pudding Race in freezing cold conditions, with torrential rain and high winds! 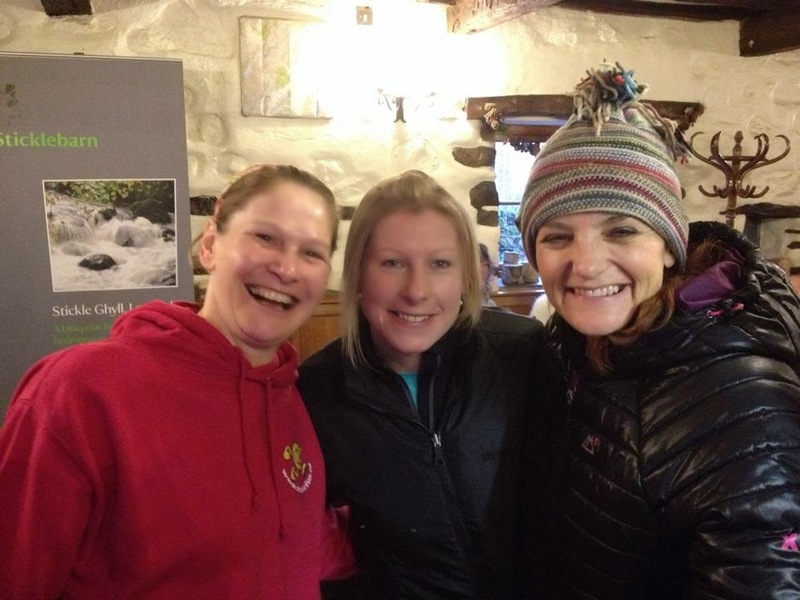 I was doing the race with 2 friends and we left Kendal at 10am for the 18 mile journey to Great Langdale arriving at around 10:45am for a 12 O Clock start! We were directed into a field to park by the race organisers and then were charged £4 for the pleasure! Luckily at this point it was still dry as we were sent to the farthest parking place possible at the opposite end of the field! We went to The Stickle Barn Tavern to use the facilities and have a brew! It was full of like minded folk but we managed to locate a seat and enjoyed our last bit of warmth! At around 11.40am we decided we had best make our way back to the car to strip down to our running gear! On entering into the outside world again we were dismayed to see the rain was now teaming down! We had a quick jog to the car, got out of our nice warm outer garments and then sat there looking out! We discussed lightheartedly just going home at this point, but we didn't! We sat for as long as we dared before braving the elements and making our way to the start line! I had opted to wear a long sleeved running top, three quarter running pants and gloves! 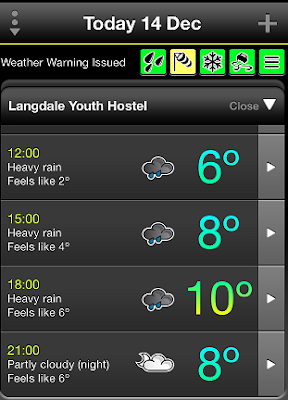 Thank God I had my gloves - I think without I might have suffered hypothermia! We huddled together trying to protect ourselves from the rain coming at us sideways, and as sods law would have it the race was late to start! Eventually at around 10 past 12 we were off! I didn't hear a starting pistol but the runners in front of me moved so I took it as a signal we were going! The start was very congested with people darting around trying to avoid puddles! In the end I just thought sod it and ploughed through whatever was in front of me! After all I was wet - how much wetter could I get? I found the start very frustrating as I seemed to be surrounded by runners in fancy dress! I know its the festive season and all that but when I was getting whipped in the face by the back of a Christmas tree, blinded by a Mrs Santa cloak and poked by a star I didn't have very festive thoughts! Luckily the field soon thinned out and I managed to escape the fancy dress crew! My plan had been to stick with one of my friends who is a slightly faster runner than me so I would push myself and get a PB! This plan collapsed even before I crossed the start line! In all the chaos and congestion I lost her so I was on my own! With such challenging weather conditions and with it being a non-chipped event I don't think a PB was ever on the cards but I tried my best! The course is an out and back route, slightly undulating (HILLY), along the Great Langdale Road. Starting at the New Dungeon Ghyll, running to The Langdale Estate in Elterwater and returning to the New Dungeon Ghyll. I tried to maintain an even pace but there was an awful lot of "sprinters" who then walked up all the hills! The same people sprinted past me numerous times on the flat sections for me to swiftly run past them again on the up hills! By mile 6 I was drenched and starting to feel cold so I was delighted to see the field where the finish line was! As I entered the field and the channel marked out to the finish line I looked ahead to look for the finish arch which was insitu at the start to see how much further I had to run. I couldn't see it so I just kept on plodding. There was no chance of a sprint finish as this section was very muddy and slippery so I was relieved to reach the finish without landing on my bum! I was only aware I had reached the finish when I heard someone announce my number and a time! Apparently the Finish arch had blown away in the high winds! My Garmin stated a finish time of 54:38, and my official time was 54:55. You can view the run here. and the official results here. I was 238th finisher out of 473 runners, 58th female out of 212 females and 15th out of 46 in my age category. So even though I didn't get my desired PB I'm pleased with the result! 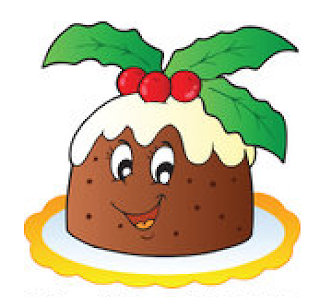 Once through the finish I went into the marque where I got a full size Christmas Pudding and a T Shirt, along with some Haribo's! I met up with Susan in the marque who had finished in 51 minute's, so if I had stuck to my plan of sticking with her I would have got a PB! We then made our way back to the car to change into some dry warm clothes whilst we waited for Julia! Once Julia arrived the fun began! The next challenge - How to get out the car park! We sat for some time watching the chaos around us! Most cars were wheel spinning their way to the exit, and many of those got stuck and needed a helping hand in the form of a push from the Marshall's and other runners! After laughing at everyone else's antics we decided it was time for us to brave the journey ourselves! Off we set slowly making our way to the exit and were very disappointed not to get some of the excitement - Susan's car made it look easy! So all in all a good race for my last one in 2013 with some beautiful scenery - just a pity about the weather!! !